Prominent saxophonist during the late 1940’s and throughout the 1950’s who had some early success as a featured artist before getting even more acclaim backing others in the studio. 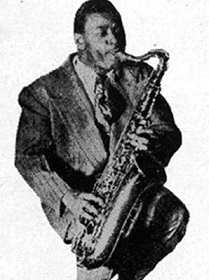 Culley was born in 1918 and unlike many of his contemporary sax stars from rock’s early days he didn’t have any notable success in another field of music before moving towards rock ‘n’ roll. Though he’d been leading his own band for a few years, first in Virginia and then with increasing notoriety in New York, he’d never recorded, either on his own or behind others. But his style was perfectly suited to rock music, already earning him the sobriquet “Floorshow” before he ever stepped into a studio for the first time on the small Lenox/Continental label in late 1948. Soon he was called in to play on sessions behind reigning rock superstar Wynonie Harris for King Records. When that label shortsightedly failed to sign him for a recording contract of his own (after doing the same with Hal “Cornbread” Singer a year earlier, who then went on to a hit making career elsewhere), Atlantic Records stepped in and inked Culley to his own deal, setting his career into orbit. While with Atlantic over the next three years Culley helped shape the instrument’s capabilities, both with a series of instrumental records which included two sizeable hits, as well as backing other artists in the studio. It was here that he’s credited with his most notable role in rock’s evolution when his group, which included legendary pianist Harry Van Walls, was enlisted to play behind The Clovers on their initial Atlantic session. Culley, as was his right as the leader of the group, insisted on being paid leader scale though the company hadn’t planned to his use his horn at all in the arrangement. When Atlantic had no choice but to pay him per union rules they told him if they were going to pay he was going to play, which he was more than happy to do. The hastily re-arranged backing for “Don’t You Know I Love You” featured his tenor taking a blistering lead and his performance was widely credited as both helping the record become a #1 hit as well as showing the aesthetic musical value of honking sax interludes in the previously more subdued vocal ensemble approach. This unplanned turn of events gave Culley an enormous amount of influence on rock’s ensuing style, as the raunchy tenor sax became a ubiquitous part of virtually every vocal group record over the next decade. But his own time with the company was about to come to an end as he left soon after and recorded for a number of labels without success. He remained a popular club performer for years however as it enabled him to unleash his crowd-pleasing antics which had gotten him his reputation to begin with. Though short-lived as a rock star his time was well-spent as well as very productive with serious long-range historical implications to boot. Culley retired from performing by the mid-1970’s and passed away in 1983.